Hi all, well I promised to have the Centurions finished by this week, and they are. 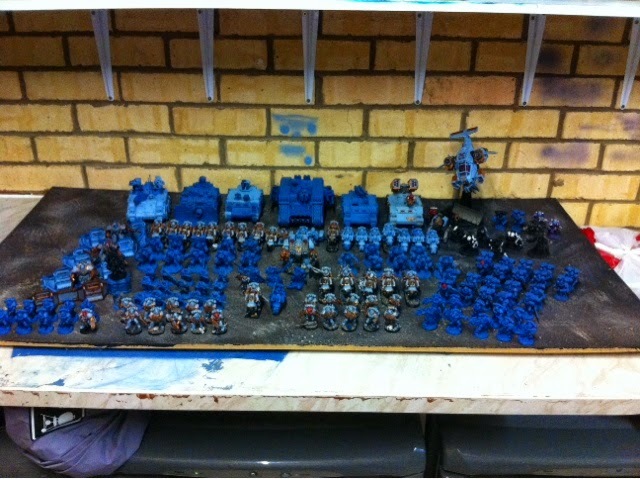 This is a picture of the 1578 points of Iron Fists I have got completely finished so far (bar the odd couple of bases). 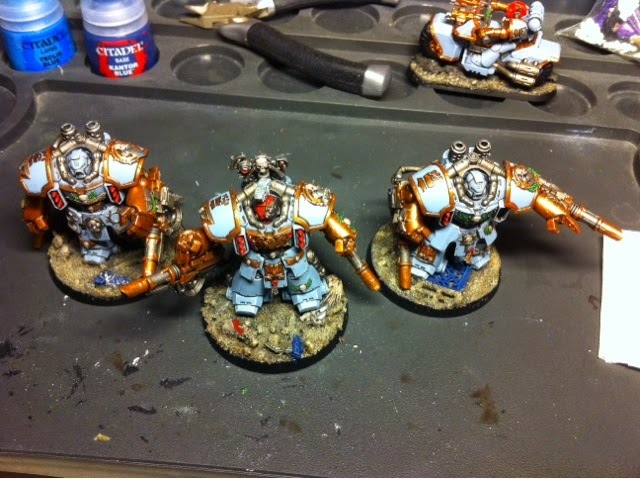 Here are the centurions themselves, in detail. All the lascannons are magnetised so I can rotate them out for the odd game when I might want to turn these guys into grav cannon devastators or assault centurions. This is my favourite pose of the three, striding forward ominously. And the final model - one set of missiles appears to have gone walkabout but I'm sure they'll turn up soon. 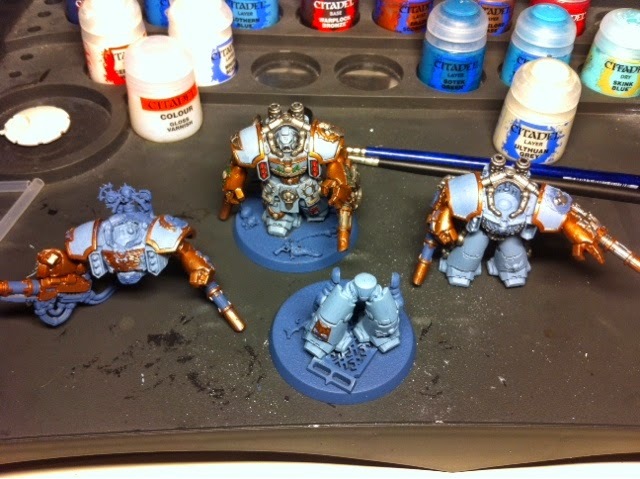 These guys were really fun to paint, round the back of the model you can really see the detail of how the marine stands within the centurion suit, and whilst the models are not very poseable due to the various connecting rods and pipes, there's a nice mix of armour colours and metallics to apply. 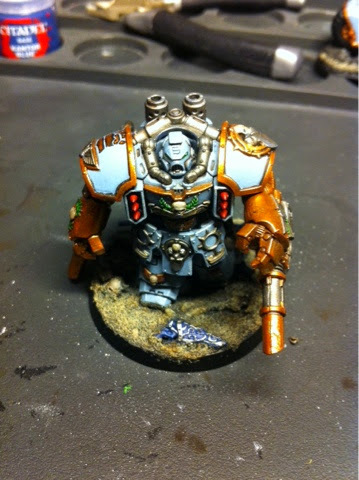 So having finished the Centurions, what was I going to paint next? Well, there's a model been sat in my model box for a while that was just screaming out for a paint job, so here he is. With that finished then, what would I get round to next? Next up on the painting table. Hi all, it feels like ages since I last posted, though fear not I have been beavering away on hobby projects in my absence. My centurions are complete (well, all bar one missing missile launcher, which seems to have disappeared into the warp - I'm sure it will turn up eventually). 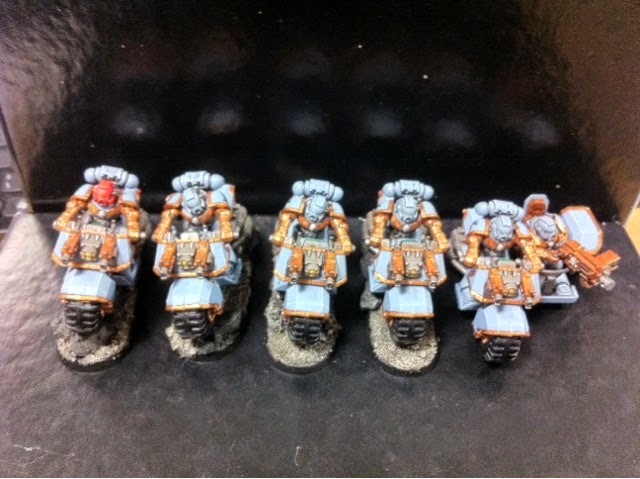 So with them complete, I only need to finish 1 bike squad and a drop pod to have my first 1500 point list finished. Of course I've been distracted, partly by an assault squad, and partly by my secret project. My next clue then for the secret project is that they are using a white undercoat, which I almost never use these days. Obviously I can't post pictures of the project, but I can safely say the first two models are built, and paint has been applied to a small section this evening. Hopefully normal service will be resumed tomorrow with a tactical post. 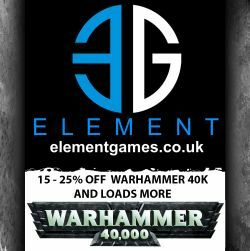 Morning all, I'm very excited this week, as over the weekend with eBay sales and a clear out of DVDs I manage to raise enough cash to do two things, buy some dice to match the iron fists (I'm a sucker for having faction specific dice!) and more significantly, purchase the first three models of my secret painting project, The Revenant. Now I know I've promised some clues from this before, but I wouldn't want to give too much away too soon, so today's clue is that the army incorporates rules from a data slate. Right, so enough of that, what have I painted this week? Well I've not made huge progress I'm afraid, a couple of brief lunchtime sessions is all I managed until last night, as the weekend was taken up with Fathers Day stuff. 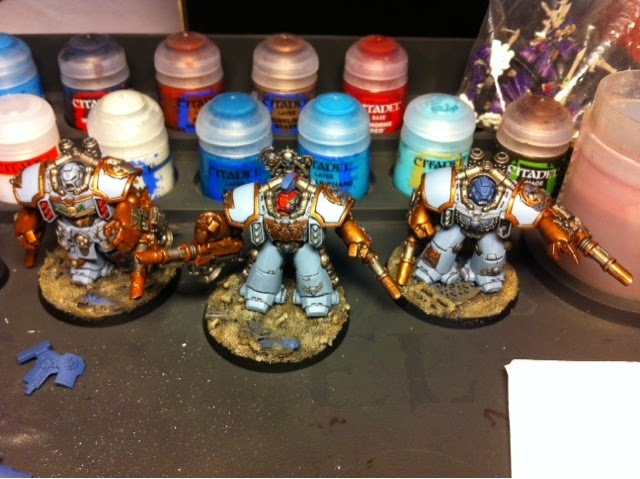 I have however made some progress with the centurions, getting the top layer of blue finished on them all ready for the gold layer and highlights, here's a picture. I've promised myself to have these done for you for next Mondays update and I've got a big chunk of time on Saturday set aside for the task, so hopefully next week I should have something new on the bench to look at. Hi all, time for another random musing (I know, I missed my tactical post this week I'm sorry) and this one was inspired by one of my clubmates. How often do we sit down and actually take stock of what we have for any particular army? Sure, I use a variety of stuff in games and I have my general all comers lists, but how often do you actually sit there and assess what options you have, and what could you take if you wanted to? I do it very rarely, but with unbound lists becoming an option under 7th edition rules, what's to stop you taking your whole collection in one big almighty apocalyptic clash? Nothing except your imagination, that's what (oh yeah, time and opponents, but you get my point). With that in mind then, here's my complete collection of iron fists models, some painted, most not. There's plenty more needs to be added to this too, with no storm ravens, no drop pods, only one dreadnought etc. enjoy! And for the record, it's about 5600 points. Morning all, time to update you all on my painting once again, though it's going to be an odd one this week! First off, I've split my painting time this week between two projects, the first is the iron fists centurions you can see above, which are coming on nicely. The second is now ready for washing, and the third should be at that stage by the end of tomorrow lunchtime. The other project is my secret army, The Revenant. I've been working on a test model, trying to figure out the detailed elements of the scheme I've had in my head for a while. It's a big departure for me, because it's based on a white undercoat and is using drybrushing in a way I've not tried before. I'm also experimenting with paint finishes and metallics, trying to blend different textures and colours that I wouldn't normally use to make a visually distinctive army in the tabletop. I don't want to say too much more just yet, but suffice to say I will be keeping full notes and documenting the construction to feature as a series of posts later. I'm planning on buying the first proper model of 21 in the army next week, make of that what you will, all will be revealed in due course! Hi all, here's a battle report for my Iron Fists when I took on Ryan's new Adepta Sororitas army. it's his first game with them, but not only has he never lost to me in a 1500 point game, he went the entirety of 6th edition at club without losing a solo game at that level. So here was a great opportunity for me. Hi all, hope you're well - today's random musing is inspired by some work i've been doing recently on a project that had sat on my shelf for a while. What I'm going to be talking about is re-kindling the love for something you've put to one side for whatever reason. Hi all, here I am again with some more thoughts on tactics in 7th edition, and in particular today I want to discuss the topic of walkers. 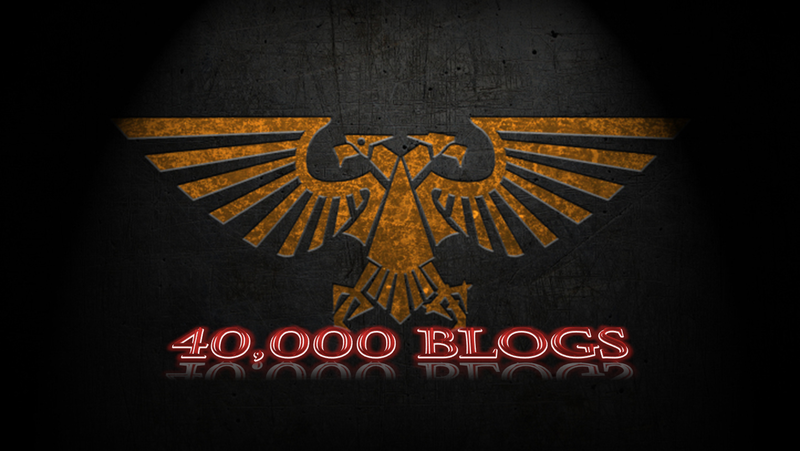 Inevitably I'll be focussing on those I know the most about (so space marines, eldar, Necrons) so here we go. First off of course, we have the change to the damage tables, meaning explosions are rarer. So, walkers will last longer. Secondly, they now pick up hammer of wrath, so when charging you will likely be doing extra damage, particularly given the higher strength of most walkers. Fourthly, charging units aren't safe from overwatch - walkers can fire overwatch, and more importantly, can do so even if the charging unit is outside it's usual fire arc (unless immobilised). Time to dust down that twin flamer load out! Many units will think twice about charging a unit capable of putting out twin walls of death! It's a fairly short list really, but they are still vulnerable to high strength shooting from the rear, as few have heavy armour there. Secondly they are pretty hampered by most of the penetrating hit results on the damage table, since a lot of walkers tend to be heavily armed, and limiting them to snapshots really hurts their effectiveness. So, what walkers would you take and how to equip them? You've basically got three types here, and the reasoning behind the bog standard dreadnought hasn't change much, I'd say there are two really viable builds. The first is the suicide melta dread, equipped with a multi melta and in a drop pod. 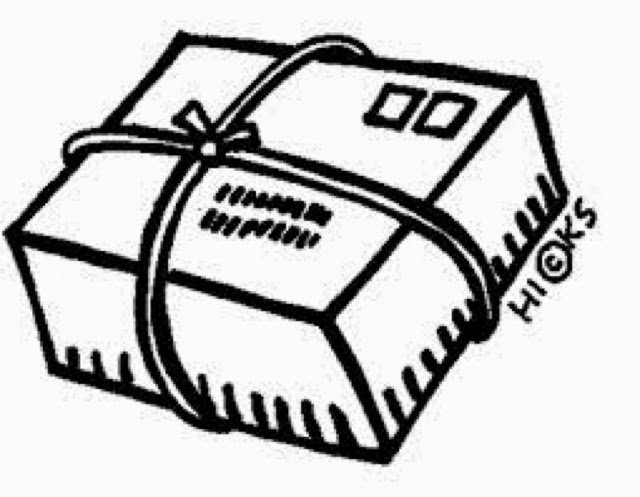 It arrives, let's off the melta shot and if it survives the return round of shooting, can really put a spanner in the strategy of your opponent. 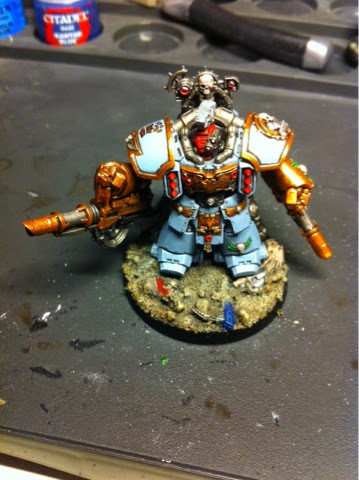 Second is the rifleman, with two twin linked assault cannons. It's basically a quad gun that can shoot at ground targets, but it's decent for stripping hull points from lighter vehicles. Second on the marine list is the venerable dread, now a lot of people really didn't like this option before, but the extra points give you a noticeably better BS, and now that exploding only happens on a 7+, being able to force your opponent to re-roll those results is massive! Finally we have my favourite, the ironclad. An extra point of armour on the front and sides means this baby isn't going to be hurt by much. I like to drop mine in amongst the enemy lines with twin heavy flamers and see what's still alive on turn 2 to charge. 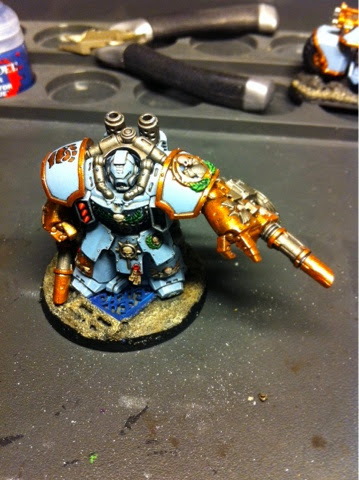 Ok you think the marine dreadnought is good? Try the Triarch stalker - it may only have one weapon but the basic armament is either a two shot multi melta or a heavy flamer (and can choose to be either during the game) or you can give it a large blast one shot autocannon, or (effectively) a lascannon. Added to that, any hits it scores on a unit means other Necrons shooting that same unit are twin linked. Oh, and it ignores crew shaken/crew stunned results on a 2+/4+. Did I mention it's quantum shielding gives it 13 front and side armour until a penetrating hit? Well for starters they come with an invulnerable save and can put out an obscene amount of firepower. The weapon systems are not twin linked, so firepower is potentially doubled. For ten points it can also get the 2+/4+ to ignore shaken and stunned results, and these guys are fleet scouts with battle focus, so can run and shoot in the same shooting phase after amending their deployment to better counteract the enemy. Weapon variations are cheap too, and the scatter laser option gives you twin linked on the other weapon provided it hits at least once. So there you are, pros and cons of walkers and a brief rundown of some of the examples. I'm predicting we'll see them much more in this edition, I know I'm planning on expanding my collection! That's enough blue and gold for a bit! Morning all, finally got those bikes finished, as you can see above, so here's this week's painting update. Of course, having slogged hard in my available time last week to get the bikes finished, it was inevitable that on Thursday when I planned to use them, I got all the way over to my club before realising that they were still sat in a bag in my garage! Still, I managed to cobble together a 1500 point list, and thanks to a last turn burst of speed from a razorback, managed to claim the central objective to win my first proper carnage game. 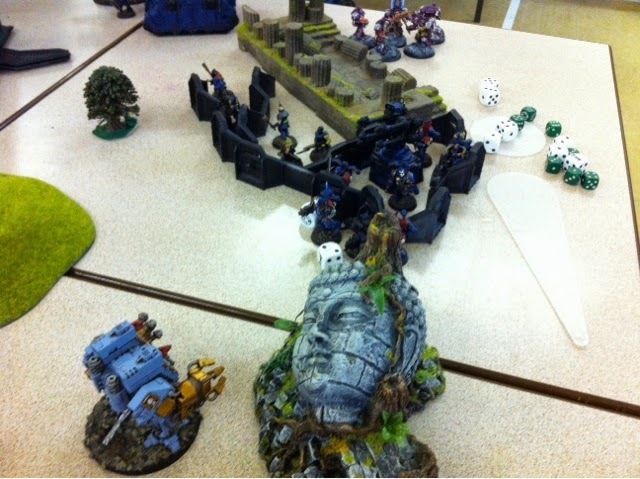 In fairness though, much of the credit must go to Toby, who dropped Belial in amongst the grey knight/ultramarine alliance to hold them up for most of the game. 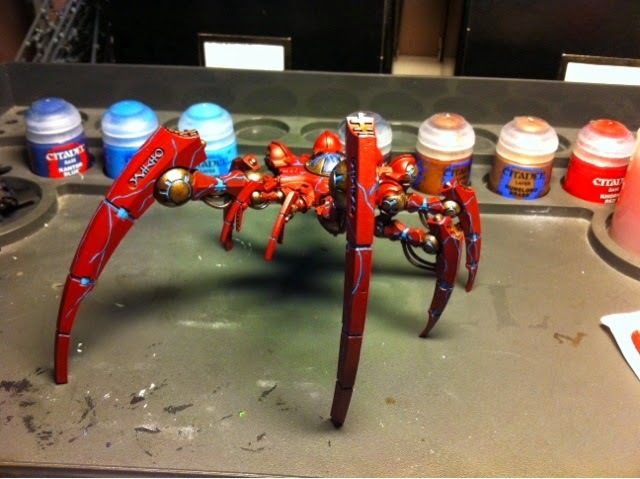 With a busy weekend planned, I didn't get to sit down at my painting table again until last night, when I figured I'd had enough of gold highlights so started something different - I found my fledgling Necron empire in a box, with it's paint scheme I was largely unhappy with, and began working on something new. Here are the fruits of my labours so far, but with a few hours free this week look out for more progress on them next week. 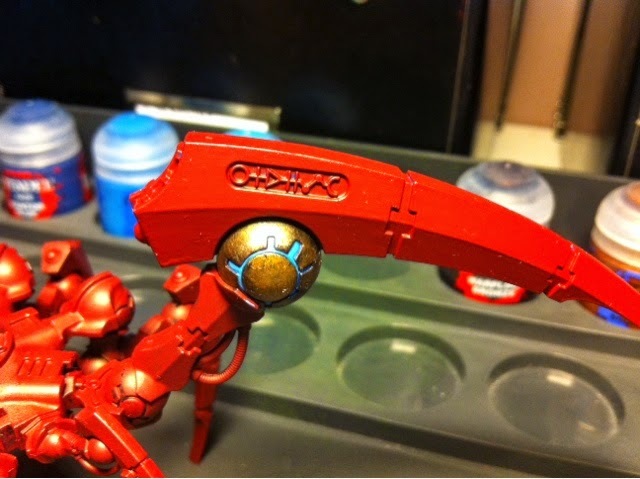 The red in the photo is much brighter than in real life, and I'm planning on adding plasma 'crackles' along the armour from the power spheres to really liven them up.